We’ll be on site at the Sunday School Garden over the opening weekend of Saltaire Festival as part of the Open Gardens trail. Drop by to say hello, take a look at what we’ve been growing this year and pick up a treat from our stall of homemade goodies. 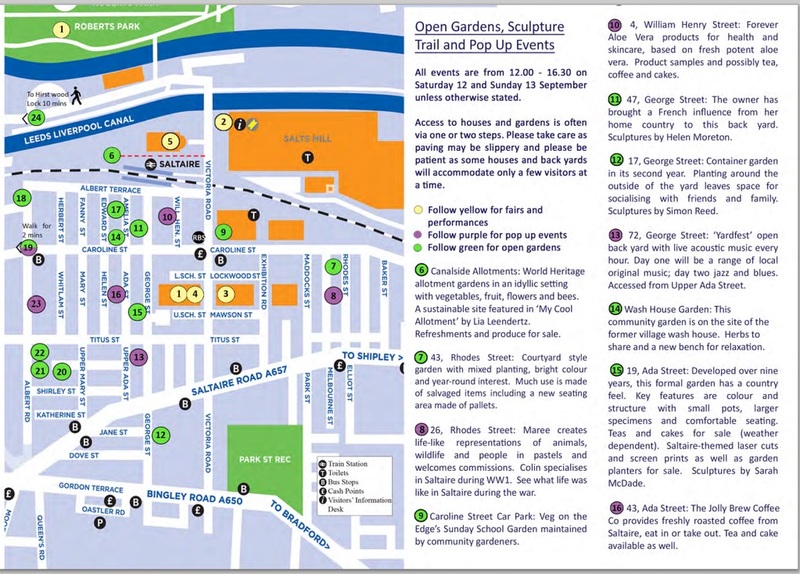 Click here to download the opening weekend guide featuring the Open Gardens and Sculpture Trail, as well as the Makers Fair, performances, exhibitions and pop ups in village houses. Free event, just turn up. This entry was posted in Events and tagged Saltaire Festival, Saltaire Open Gardens, Saltaire Road, Sunday School Garden on September 3, 2016 by Veg on the Edge. We had a wonderful weekend at the Saltaire Festival as part of the Open Gardens trail. It was lovely to meet so many people interested in the Sunday School Garden in Caroline Street car park. 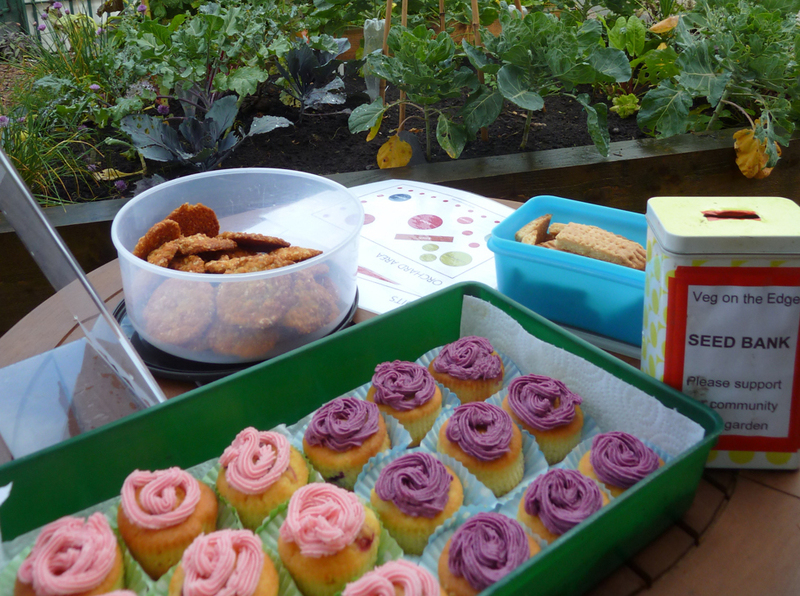 Thanks to everyone who generously donated to our home-made cake stall or filled in a survey. It was lovely to get feedback on what we’ve been doing, what people would like to see, and how they might get involved. Everyone we met agreed that they’d like to see more community growing spaces in Saltaire. We’re currently well on the way to developing projects for further sites, so that more of us can get involved and help make our neighbourhood even better. We’ll post more updates on this soon as we can. We also heard that it’s difficult for some people to escape work in time for our regular Wednesday 6pm session. Starting in November, we’ll be adding an extra session on the first Sunday of the month at 11am, so that more folks can join us. Just turn up and muck in. The perfect way to work up an appetite for your Sunday roast! 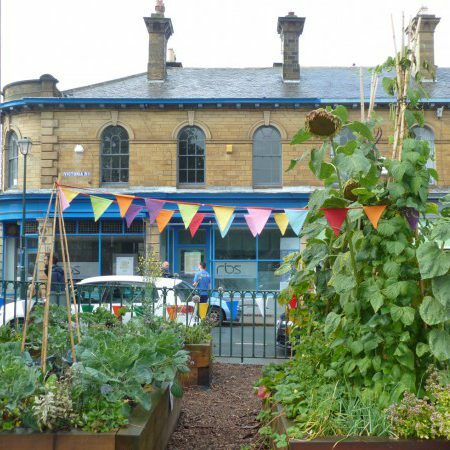 This entry was posted in News and tagged Community Food Garden, Saltaire, Saltaire Festival, Saltaire Open Gardens, Shipley, Sunday School Community Food Garden, Sustainable Saltaire, Veg on the Edge, VotE on October 25, 2015 by Veg on the Edge. 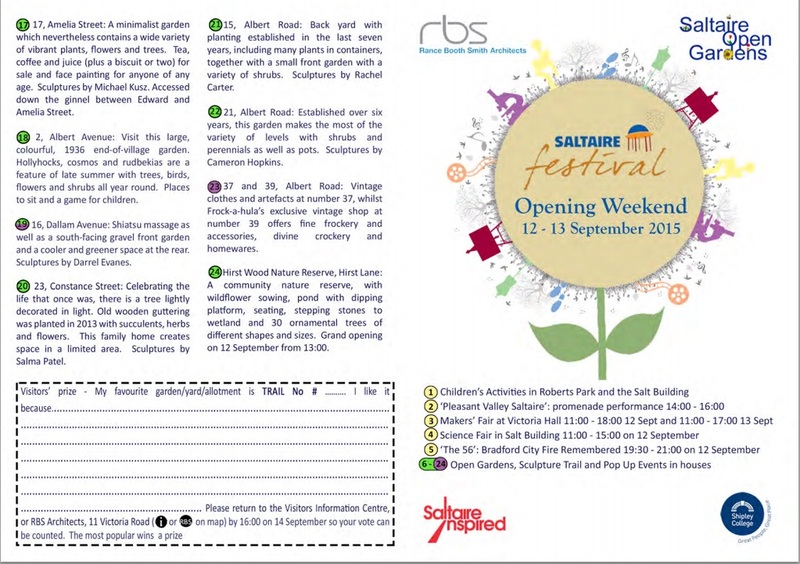 We’re delighted to be taking part in this year’s Saltaire Open Gardens, during the opening weekend of Saltaire Festival 2015. We’ll be on site at the Sunday School Community Food Garden at the Caroline Street car park from 12.00pm to 4.30pm on Saturday 12 and Sunday 13 September. Do drop by to say hello and take a look at what we’ve been growing this year. We’re really keen to get feedback about the garden from people living in the area and hear your views on local community growing. There’ll also be some tasty treats available for anyone who’d like to make a donation to the project! This entry was posted in Events, News and tagged Community Food Garden, Saltaire, Saltaire Festival, Saltaire Open Gardens, Shipley, Sunday School Community Food Garden, Sustainable Saltaire, Veg on the Edge, VotE on September 9, 2015 by Veg on the Edge.